More than four years after launching with beers such as a Cognac barrel-aged double IPA and a cherried, barrel-aged sour black ale, Moon Dog has entered the fray in the most densely populated part of the Aussie craft beer world: the hoppy, pale, around 5 percent ABV ale arena. Indeed, they're doing it with a beer that is very hoppy, not as pale as some, but very much 5 percent ABV. Old Mate becomes part of the Abbotsford brewery's trio of six-packed core beers, alongside Love Tap and Mack Daddy, bringing some eye-catching, borderline neon orange – plus what appears to be a Bandido lemur in spurs – to the party. Brewery co-founder Josh Uljans told us on the eve of its launch that they've always seen Moon Dog as "fun" rather than "scary" in terms of their approach to brewing and that, while some might look at these beers and say the brewery known more for out there innovations, wild beer names and labels is becoming boring in its old age, the core beers are still very much "fun" and "Moon Dog" beers. 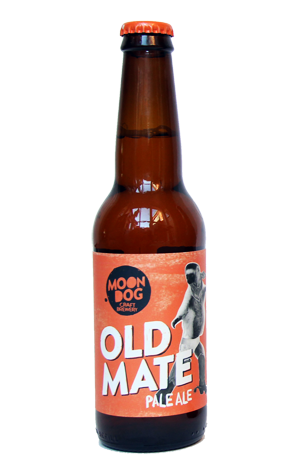 In terms of Old Mate, ostensible an American pale ale, fun and Moon Dog comes across as a beer with plenty going on. There are distinct Cascade hop characters in there, contributing heavily to hop aromas and flavours that range from piney, earthy, woody, spicy and dank to fruitier peach and orange. There's some dark caramel malt floating around and a resinous bitterness rounding things off.